18+. New customers only. Valid for players from the UK. 3x wagering requirement applies to cash out your winnings. Unused bonus expires in 60 days. T&Cs apply. 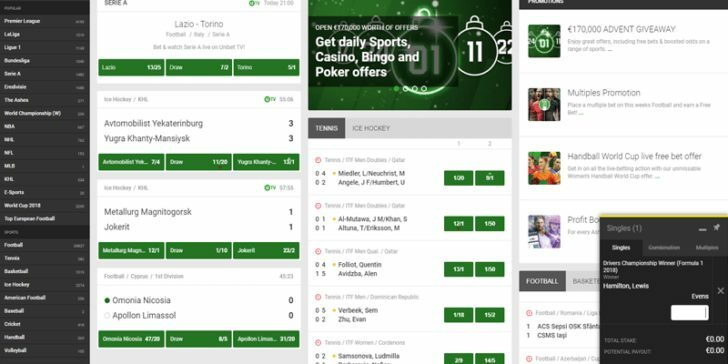 Unibet is an online sportsbook that uses its own proprietary software. This site offers fixed-odds betting on all major sports categories, including soccer, Formula 1, basketball, baseball, tennis, cricket and many others. Several bet types are offered, depending on the event type. Many major events even allow Live In-Game Betting, which lets players wager on live sports events in real-time as the action unfolds. E-sports gambling is also available at Unibet Sportsbook. To bet on online gaming event, player will need to click on the Sports section on the top of the website. Right after that thy need to click on Sports underneath as well, and on the left side, under Sports, the gaming market „E-sports“ will be visible. Upon doing that, all the available E-sports betting market will be seen by the customer. Unibet Sportsbook has been voted the ‘European Sports-Betting Operator of the year’ twice in the past three years. Players are provided with the best customer service and quick payouts. There’s a live score feature where players can get score updates and other vital bits of information about any ongoing event. A mobile betting service is offered as well, letting players make wagers from anywhere – even while watching a game live at the stadium! Unibet Sportsbook’s Online Horse Betting Promotions Give Away Cheltenham VIP Packages! Bet on UEFA Nations League and Win Football Tickets of your Choice! Win a Trip to Japan and Meet Mika Hakkinen! Place a Risk Free Mobile Sports Bet at Unibet! Earn Cash Back on Premier League Losing Bets at Unibet! Earn Massive Cash Rewards by Inviting Friends to Unibet! This Unibet Sportsbook CSGO Betting Bonus Gives Away DKK 100,000! Win Your Share of €50,000 Thanks to Tennis Betting Tournament at Unibet Sportsbook! 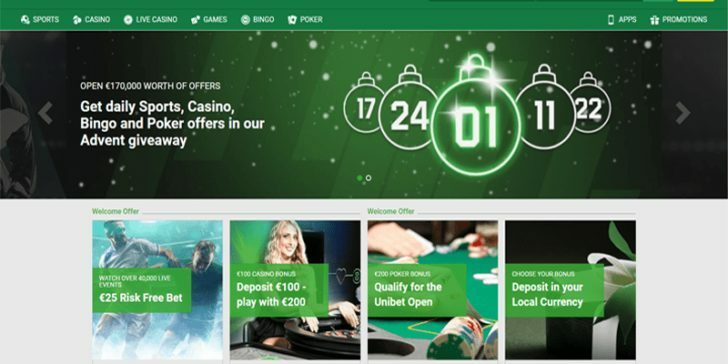 Spend €10, Get €5 Weekly Free Bet Bonus with Unibet Sportsbook! Play at Unibet Sportsbook for a Chance to Win a Trip to Cheltenham! Receive a £30 Welcome Bonus With Unibet! Play at Unibet Sportsbok to Win Hundred Thousand Euros Online! Win Free Bets For International Matches This Week at Unibet Sportsbook! Join Unibet Today and Double Your Deposit! Claim up to €5 Free Bet Every Week Thanks to Unibet Sportsbook’s Premier League Promo! New eSports Betting Bonus Offers You a Share of a €5,000 Prize Pot! Win Water Polo Free Bets for Betting on Hungary v Italy at Unibet! €50,000 is up for Grabs Betting on Wimbledon with Unibet! Bet on Lewis Hamilton To Win, and Earn Cash Back Even if he Doesn’t! Bet on the NHL or NBA with Unibet to Earn Huge Cash Prizes! Protect Your NHL Bets in the UK With Unibet! Enjoy Awesome NBA And NHL Playoff Promotions at Unibet! Unibet is Offering Their Members the Chance to Meet Mika Hakkinen! Enjoy Awesome Champions League Final Promos at Unibet! Win Free Tickets to the Epsom Derby this Year with Unibet! Win a Free Eurovision Bet This Week With Unibet! Earn Money Back on a Grand National Bet at Unibet! Win Free Football Bets This Weekend Wagering on Atletico vs. Barca with Unibet! First Bet Refund at Unibet! Take Part in Unibet’s Ultimate Football Betting Championship! Take Part in the Unibet Wimbledon Live Betting Championship!